Magic crosses over into our world in the form of 40 new magic items ranging from the marvelous (The Anubis Battery) to the mundane (Toby Wilson's Ice Scraper). 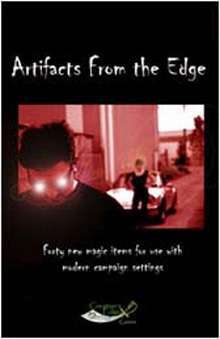 Artifacts From the Edge features detailed descriptions, illustrations, and adventure seeds for magic items with a modern slant. Detailed background information for each, designed to give the GM a feel for the item's history and potential. In some cases this information is presented in story format, delving into the item's origin or describing it's recent past. Adventure seeds- over 2-dozen suggestions for incorporating Artifacts From the Edge into your modern campaign. For use with modern d20 settings. The PDF version includes a printer friendly version and bonus material taken from our Buck-A-Batch: Modern Magic Items product. An in-game karmatic reward system for d20 fantasy settings! This title was added to our catalog on December 18, 2005.